Freshman guard Maddie Loder faces off against a St. Bonaventure player during a home game last week. Even with its senior leader back on the floor, women’s basketball suffered a setback with a 56–48 road loss to Richmond in GW’s final regular season contest. Senior guard Mei-Lyn Bautista, who had missed GW’s last two contests for a possible concussion, had 10 points, five assists and three steals in a 40-minute return to action. Sophomore forward Neila Luma led all scorers with 16 points and nine rebounds on 8-for-21 shooting. But the Colonials’ (10–18, 7–8 A-10) 48 points on 35.7 percent shooting from the field was their lowest offensive output since Feb. 10. Meanwhile, the Spiders (9–20, 6–10 A-10) shot 45.8 percent from the field, knocking down 12-of-20 second-half shot attempts. The Colonials picked up 30 points in the final 20 minutes of play after being held to 7-for-28 shooting in the first half and brought the game within two points in the third quarter. But GW could not get over the hump as the game wore on. Freshman guard Maddie Loder, a regular in the starting lineup since conference play began in January, came off the bench as the Colonials opened with a big lineup featuring freshman center Kayla Mokwuah and Luma in the frontcourt. Bautista got off to a fast start, collecting five points in a sloppy and fast-paced first quarter which saw the Colonials turn the ball over five times. The Colonials trailed 11–10 after the opening period when they shot 33.3 percent. GW went cold to open the second quarter, missing its first eight attempts from the field. The Colonials were held scoreless by Richmond’s strong defense until the 3:50 mark of the second quarter when Mahoney broke the drought with a three-pointer. On the other end, Richmond broke down GW’s defense with strong drives to the basket that fed the Spiders open layups. A flurry of late scoring brought the Colonials to halftime trailing 24–18. Luma was by far the most aggressive Colonial on offense in the first half, but the sophomore made just 2-of-10 shot attempts as the Spiders shut down GW’s typically reliable interior offense. Mokwuah, who missed her only first-half shot attempt, committed two turnovers and was on-and-off the court in the first 20 minutes. As a result, 12 of the Colonials’ 18 first-half points came from their 4-of-8 shooting from three-point range. The Colonials found more success scoring the ball in the final 20 minutes, scoring 30 second-half points. A surprise contributor in redshirt sophomore forward Sarah Overcash gave the Colonials a much-needed boost to open the third quarter. In the first five minutes of action, Overcash contributed with a baseline jumper, two offensive rebounds, a nice dish to a backdoor cutter and two drawn fouls, including a drawn charge. The Colonials pulled to within two points 28–26, but Richmond responded with a 10–2 run as GW shot 1-for-7 with three turnovers across a three-minute stretch spanning from the 5:31 mark to the 2:26 mark in the third quarter. With 1:34 remaining in the period, Richmond took a 41–30 lead, its largest of the game, but Bautista responded with a key triple on the other end to keep the deficit to single digits, 41–33, entering the final period. Bautista’s shot seemed to spur GW’s offense, which stayed hot. The Colonials scored nine points in the first three minutes of the fourth quarter, including a Savino three-pointer and a Luma pull-up jumper at the free-throw line to whittle the lead down to 45–42 and force Richmond to call a timeout with 7:09 remaining. But GW was unable to complete the comeback. 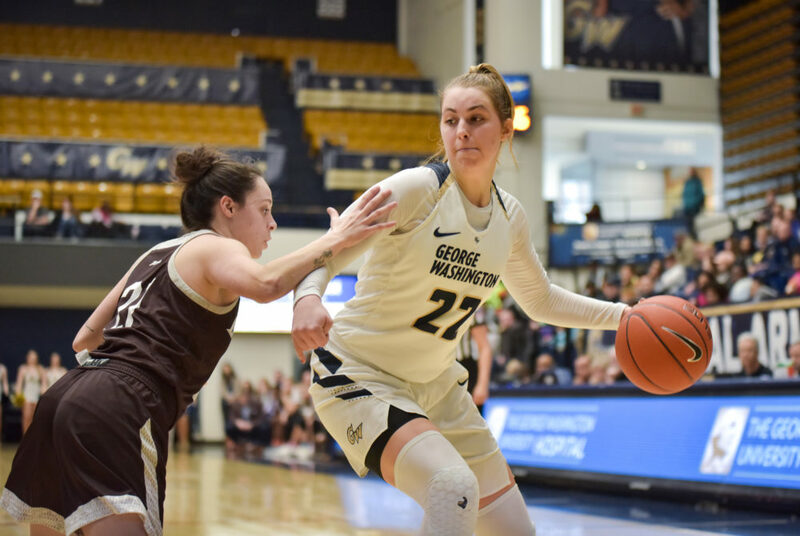 The fourth quarter was a microcosm of GW’s offense on the day, as the Colonials suddenly went cold and could not buy a bucket after the 4:24 mark of the fourth quarter, scoring just two points on a Luma layup before the final buzzer sounded. After shooting 3-for-13 across the first 30 minutes, Luma had herself a big fourth quarter, scoring 10 of GW’s 15 points in the stanza on 5-of-8 shooting. Savino, who had five, was the only other Colonial to score in the frame. “I think I just came out with a different mindset, just to be a little more aggressive and to be a little more patient with my shot, and to know that eventually I’m going to make it,” Luma said. GW entered Saturday’s contest battling Saint Joseph’s for the eighth seed in the Atlantic 10 Championship and a chance at hosting the first leg of the A-10 tournament, which begins Tuesday. With the loss, GW is now locked into the ninth seed and will be playing its next game on the road Tuesday.